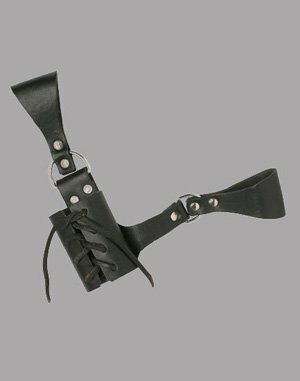 This this an economical, but high quality sword frog that allows a sword to be carried or worn at your side. 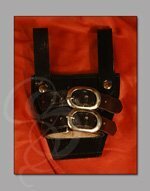 The sword includes two loops that a standard belt can be passed through to secure the frog to your waist. 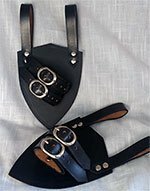 There is also a leather holder which wraps around a sword scabbard to attach the sword to the frog. The frog holds the sword at an angle that is especially useful for long swords such as rapiers. The frog hangs from the left hip which would be used for drawing a sword with your right hand.